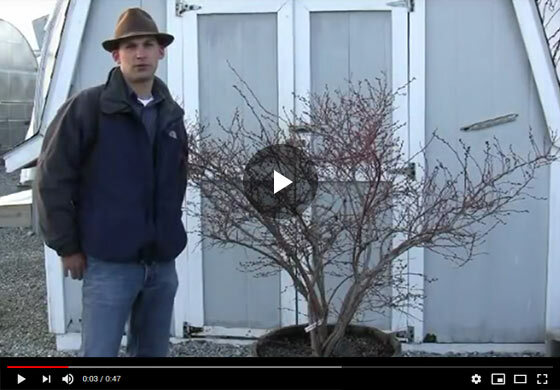 Felix, Gurney's horticulture expert shares insights into the process of growing blueberry plants in containers. Learn of the best conditions and care the plants require to deliver the best fruit output. Hi everyone, Felix here with Gurney's. Today we're talking about blueberry and here is a Ka-bluey blueberry plant that we have grown in a container, and I want to talk a little bit about doing that. It's a whiskey barrel, it's our volume there, and that's really the ideal size of a container. You could go a little smaller but to really get some blueberry production, you want a size about what this whiskey barrel provides here. And we have this plant grown in our wonderful blueberry media that we have here at Gurney's and this, you can tell this plant was planted, it was a jumbo grade, one of our larger grades, it was planted in 2007. So after three years of growth, we really have a nice blueberry framework here. And the yield is outstanding, I mean we get the first year in the ground, we got a couple of quarts and then the next year we already had you know five or six quarts of blueberries, and this thing is going to produce like gangbusters this year. You know, if you look closely, you can tell these are the fruiting buds on this plant, they're the fatter ones that are on last year's growth primarily but you can see each one of these buds is going to send out a panicle of blueberry flowers and there's going to be where your cluster forms and your blueberry set is. So, just wanted everybody to see how you can do this in a patio situation or if your soil types are a little too alkaline to grow blueberries, so you might need to make your own media so they can thrive in a container. And join us for our next video where we cover how to prune these plants. Thanks very much.